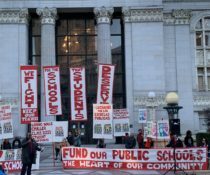 Bay Resistance | City of Oakland Demands Sanctuary Workplaces Now! 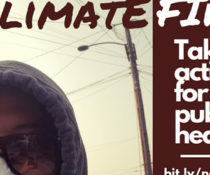 JOIN US – former Woodfin housekeepers and community allies in the historic Woodfin struggle – for a rally, street theater performance, and city council resolution honoring the workers and calling for SANCTUARY WORKPLACES in the City of Oakland! 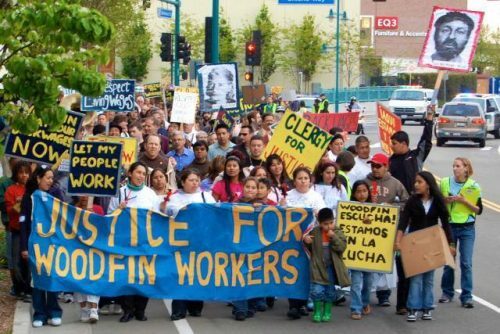 TEN YEARS AGO, in April of 2007, the Woodfin Hotel CEO used ICE to crack down on immigrant housekeepers organizing for a living wage, in a multi-year struggle of ballot measures, community meetings, firings, racist intimidation, marches, boycotts, civil disobedience, and lawsuits, and more. Ultimately, the Woodfin workers prevailed, winning the living wage, back wages, and a union! TODAY, with an anti-immigrant hotel developer in the Oval Office, we must commemorate the Woodfin immigration crackdown by demanding our Sanctuary Cities to do /more/ by calling for *Sanctuary Workplaces* so that no one has to suffer through employers’ racist, anti-immigrant scare tactics. ALL ACROSS CALIFORNIA, workers have reported employers threatening to call immigration authorities when workers attempt to exercise their rights to minimum wages, meal breaks, or organizing activity that are protected by California law regardless of status. -Protecting workers from being wrongfully detained in their workplace by requiring employers to ask for a judicial warrant before granting ICE access to a worksite. -Preventing employers from sharing confidential employee information, such as a social security number, without a subpoena. -Requiring employers to notify the Labor Commissioner and employee representative of a worksite raid. Employers must also notify the Labor Commissioner, employees, and employee representatives of an I-9 audit. -Preventing employers from retaliating against employees who report labor claims by enabling workers crucial to a labor claim investigation to receive certification from the Labor Commissioner.